Lactation Energy Bites are the go to recipe for breastfeeding moms. 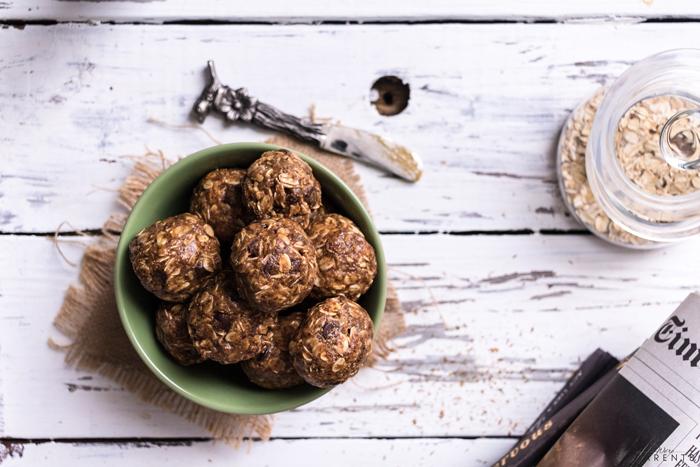 They are no bake cookie balls that are easy to make, just 6 ingredients, super flavorful and beneficial. 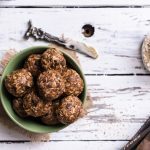 These no bake lactation bites can be made Top 8 Allergy Friendly and vegan if needed. My own breastfeeding journey, had plenty of ups and downs. There’s lots of things that may have you questioning your supply. 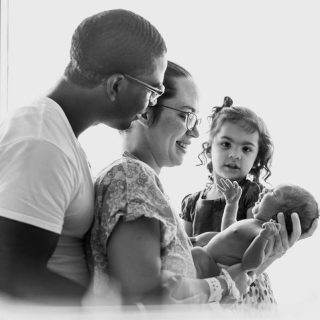 Before you continue reading, if you are a new mom or here because you think you have low supply, I encourage you to read 50+ Breastfeeding Myths Busted. 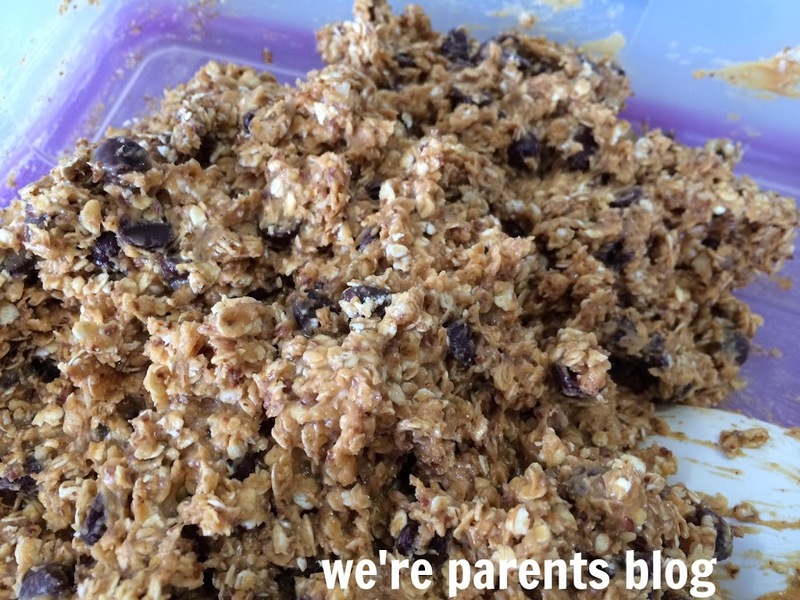 Almost a year and a half into my first breastfeeding dyad, I heard about lactation cookies. 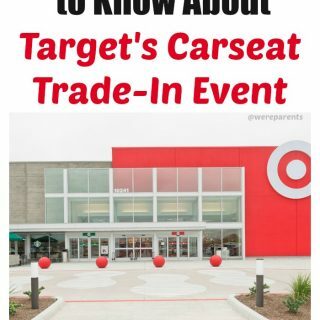 It seemed like ever since I first heard about them, I learned about so many other different types of lactation products– like bread, smoothies, and even energy bites. I wish I would have known about these when we were early on in our nursing relationship and I was constantly looking for something to pop in my mouth. I first learned about these from the Breast is Best Facebook page. They are my go to recipe for myself and other new moms! The funniest story happened the first time I ever made these no bake lactation bites . Andrew came home and I was still working on dinner. He was hungry and opened the fridge and saw the bites and popped one in his mouth. He then asked what they were and I simply said “Lactation Energy Bites”. His face was priceless and he ran to the trash can. “Why didn’t you tell me your milk was in them?”, he shouted! I couldn’t stop laughing as I tried to tell him there wasn’t breast milk in them. Lactation energy bites are supposed to HELP with milk production. It was hysterical. 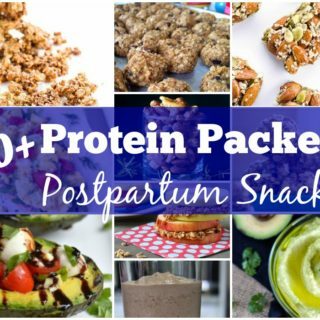 What ingredients do you need for a lactation energy bites recipe? 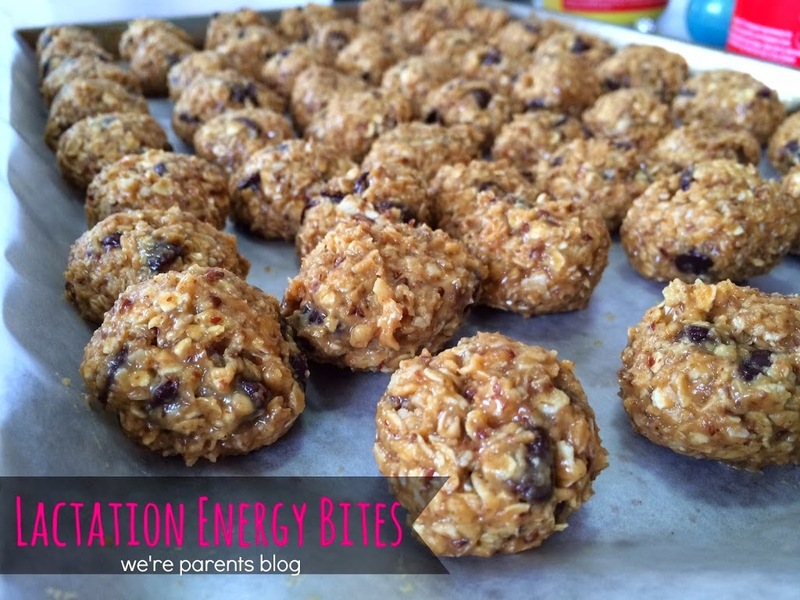 Those are the only ingredients you need to make this delicious lactation energy bites recipe! How can I make these lactation energy bites recipe Top 8 Allergy friendly? Sometimes moms have their own food allergies, and other times, breastfeeding causes moms to have to do some sort of elimination diet. Luckily, we can help with those allergies too! 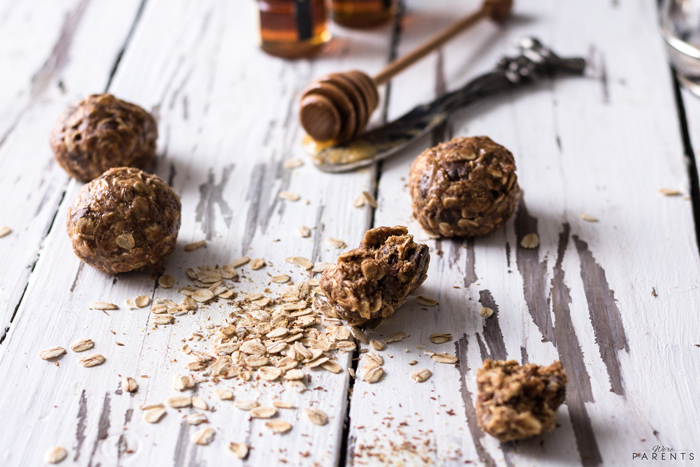 In order to make these lactation energy bites Top 8 Allergy free, you are going to want to make a few changes. First, ensure that the old fashioned oats that you are using are gluten free. While oats themselves are gluten free, sometimes companies list cross contamination with gluten on their labels. Make sure that you have a safe oat brand. Next, pick a chocolate chip like Enjoy life in your recipe. Enjoy life chips are soy and dairy free (and all other Top 8+ allergens). Lastly, swap the creamy peanut butter for sunbutter. 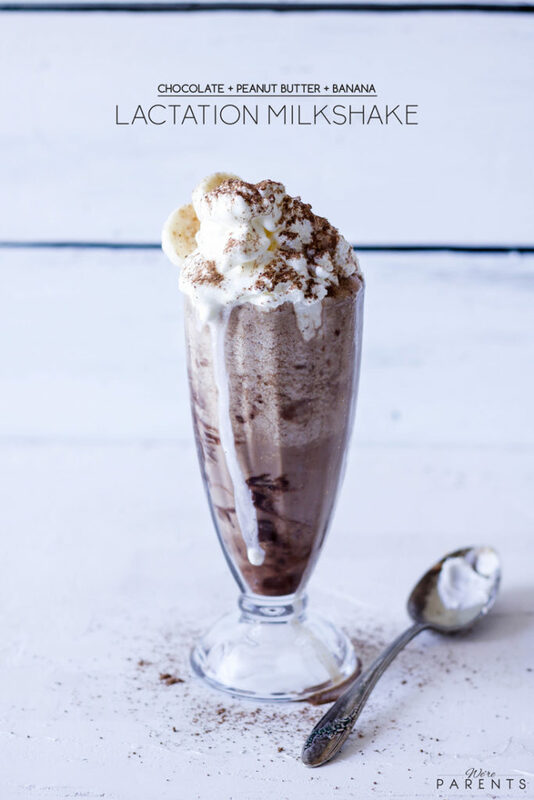 It acts the same and it will taste different than our original recipe was written, but it will ensure that these lactation energy bites recipe is Top 8 Allergen friendly. Of course, if you only have one of these allergies, you can always make the swap that you need. Can I make these lactation energy bites recipe vegan? 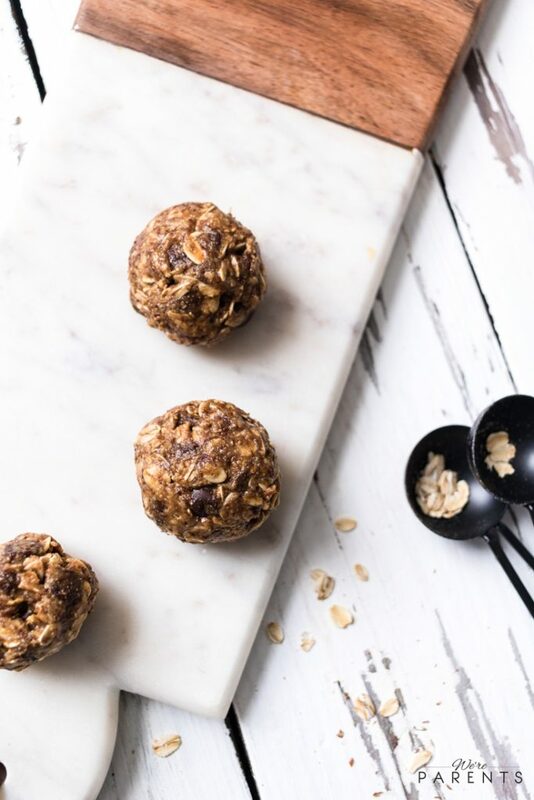 Of course, you can make these vegan no bake lactation bites! In order to do that you’ll again want to pick a chocolate chip like Enjoy Life in the recipe to ensure there’s no dairy in your chocolate. Next, you can switch out the honey for the same amount of agave. With those two simple swaps, you will make these vegan lactation bites! 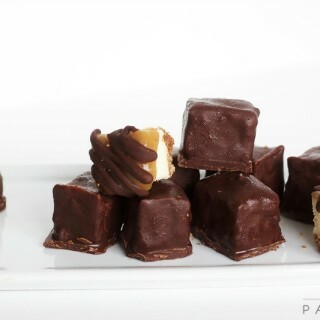 How do you make these lactation energy bites? 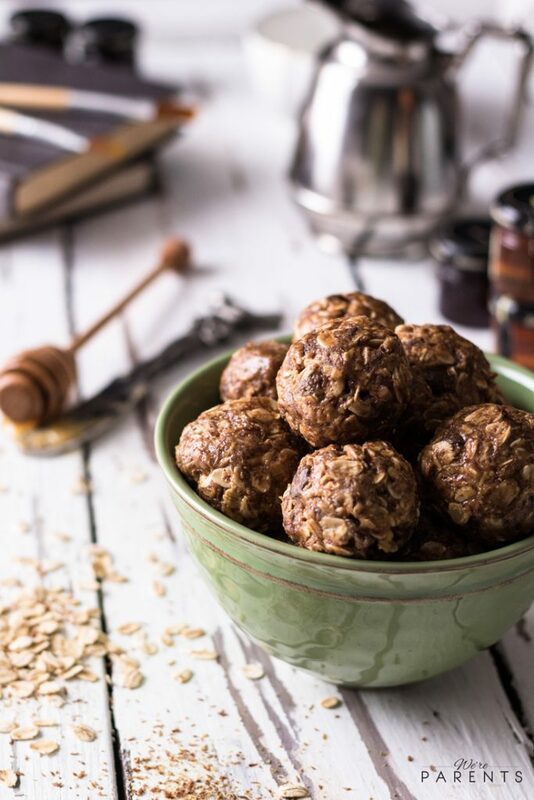 Once you have the ingredients that you are going to use to make these lactation energy bites, you need to grab a large bowl. Simply add all the ingredients into the bowl and combine really well. Next, form into balls and place on a parchment paper lined baking sheet. Finally, put them into the fridge to set up (about 2-3 hours) and then grab and go! That’s it! Told you, easy peasy! Can you freeze these lactation energy bites? You absolutely can freeze these no bake lactation bites. In order to do so, make the recipe according to the instructions. Once you have the balls made, place them on a wax lined baking sheet instead of parchment paper. Place in the freezer for 2 hours. Once the time is up, you can place the balls into an air tighter container or ziploc bag. Leave in the fridge for as long as you need them (up to 3 months). Remove desired amount from freezer and allow to thaw before consuming. Do you have to be lactating to eat these no bake lactation bites? I get these question often and the answer is 100% no. In fact, my children and even Andrew (now that he knows my breastmilk isn’t in them) enjoys them every time that I make them. There’s no ingredients in these that isn’t safe for anyone. It’s just that the ingredients combined together, just happen to be great for lactating mothers. One important note though, children under 1 shouldn’t consumer honey for risk of botulism. If you have a child under one that you would like to give these to, please follow the directions above for making these vegan. What are other lactation recipes that are good for milk production? You may also be interested in these other lactation boosting recipes! Lactation Energy Bites are the go to recipe for breastfeeding moms. They are no bake cookie balls that are easy to make, minimal ingredients, but still flavorful and beneficial. Using a small cookie dough scoop or your hands, roll into 1" balls. Place in fridge and let sit for 2-3 hours. *Crunchy peanut butter will not hold these together well. *Add an additional 1/4-1/2 cup of flaxseed if you really need an extra boost of milk production. *Please see notes in post if you need to make these Top 8 Allergy Friendly or vegan. or our Peanut Butter Apple Pie Lactation Smoothie. 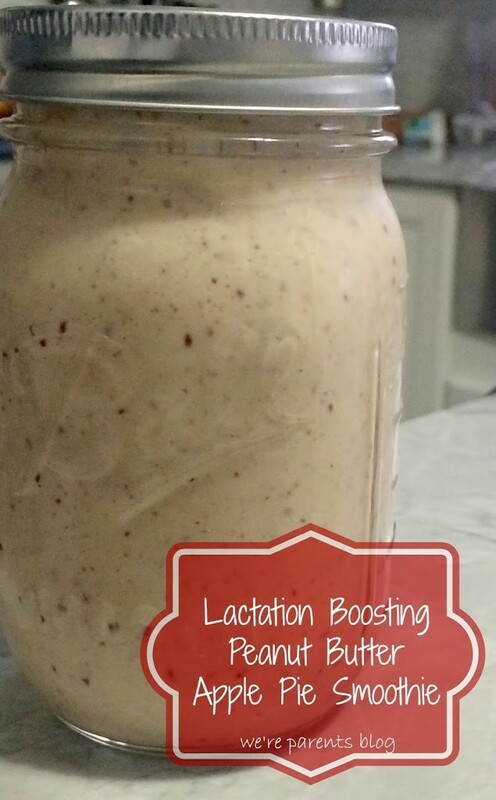 This lactation energy bites recipe was only published on 3/18/2014. Then updated on 2/23/2018 and again on 2/20/2019. 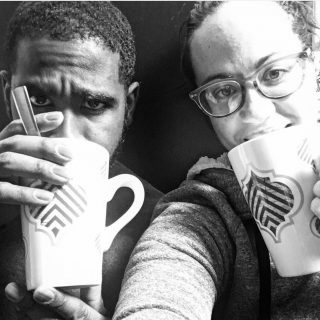 We’ve updated the pictures in this post. Original pictures below. Thank you so much! 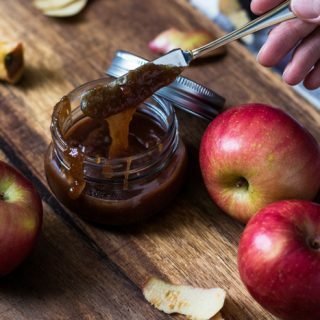 I need something that is easy to make and will help boost my supply! You are a lifesaver! Not just good for lactation.. these sound like great energy bites for anyone! This is a great recipe even if you&#39;re NOT lactating! How many would you recommend to eat, especially the first 6 week postpartum? I would eat 2-3 per day (But I’ve also ate half the mix before too 😉 ) — During the first 6 weeks, it’s all about supply and demand though, so getting baby to breast as often and for as long as possible is the best way to up your supply! Does it matter if you use the brown flaxseed or the golden flaxseed meal? It should all be the same, just different brands use different wording. Which oats did you use, old fashioned or instant. I have old fashioned oats and figure I could make them act like instant oats by blending them up a little. I’ve used both and preferred the instant/quick oats to the old fashioned. I’ve never tried blending them up though. I’m not sure how that would work! Finally made these yesterday after church and they are yummy! I did end up blending my old fashioned oats up until they resembled instant oats and it worked like a charm! 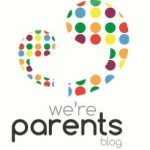 You can definitely pass this tip on to other moms! Oh great! Thank you SOOO much for letting us know! We really appreciate the tip! You rock! This recipe sounds pretty tasty, but I’m wondering about adding Brewer’s yeast to increase the lactogenic effect even more, but I’m not sure of the ratio. Too much Brewer’s yeast just isn’t tasty! Any suggestions? I’ve never tried adding Brewer’s yeast, but it would help! I’d start by making a batch with 1/2 tbsp and then going from there up to 1-2 tbsp. 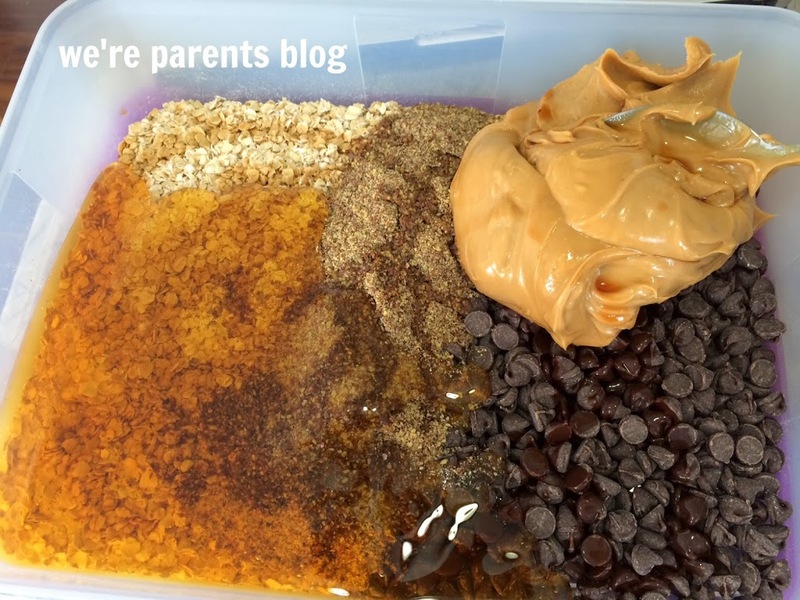 The peanut butter and chocolate should mask some of the flavor. Can I substitute flax seed for chia seeds? If you don’t have parchment paper what else can you use? How long do these keep in fridge? Do you store them in anything after they set up? Gonna try these today! Can they be frozen? And can I use maple syrup instead of honey? Thanks! I have a server allergy to nuts, is there a substitute I can use instead of peanut butter or will it work if I omit the peanut butter from the recipe? With out the extra flaxseed, does the recipe still work for supply? Everyone is going to be different, but it worked for me to maintain my supply. How much butter did you use ? Hi! Just wondering if you used Flaxseed or Ground Flaxseed? My grocery store had both and I wasn’t sure what to buy. Thanks! This recipe is amazing!! But I’m interested how many balls are supposed to come out of it. I’m wondering if I’m making them to big or to small?? What’s the recommended size?? We’ve done a big as getting 12 out of it and then 1in scoops to get 2-3 dozen. I’m so sorry. The recipe disappeared! Thanks for bringing it to our attention. It’s back up now! I feel like I am blind 😂 I am not seeing a recipe but I see ingredients. I burn toast so I do need to go by measurements 😂 Can anyone help? Thank you in advance! Is the recipe missing, or am I just not seeing it? Thanks! THESE ARE SO GOOD!! I just made a batch of these today. I added the extra 0.5 cup of flax seed plus I wanted to add some coconut oil for some fat (and that fat is good for the baby) so I added about 1/4 cup to the batter. Because of the extra wetness I added an extra 0.5 cup oats. They have a slight coconut flavor with ooey gooey peanut buttery oatmeal chocolate goodness. Thank you! Great call on the coconut oil! 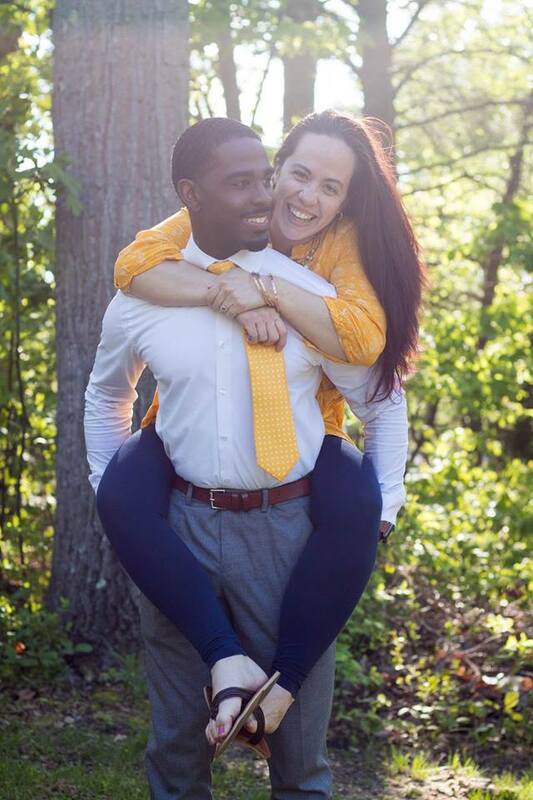 So happy you loved them! No! We just prefer the health benefits of using raw honey! How long would you say these last in the fridge without freezing? Around here 2 days because they are gone by then! HAHA. But they should be fine for at least 2 weeks. Can you freeze these if you want to make ahead before your due ?